During the fourth episode of Ashley Banjo's Secret Street Crew, Series 2, we see the Diversity leader heading down to South Yorkshire to meet five hard-working farmers. They have called up the show because they want to surprise their country music loving friends and family during a local event with an unexpected street dance routine performed to the beat of some hip hop music. On his way to the farm, Ashley declares: "I reckon they are going to be really fit, really strong. Probably pretty ripped, like beach body style" - little he knows about their 35/40 pints of beer a week regime! The initial assessment is quite funny, with the farmers showing little musicality as they firmly declare: "we are farmers, not dancers". Few days later, Ashley and the Diversity boys meet up with the beer-loving lads to perform the moves they have created for them. Despite the routine being much easier than most of the stuff we've seen so far, it still looks hugely challenging, especially considering that the farmers' age ranges from 19 to 59. As time goes by, it seems that the country boys don't really want to take the whole thing seriously, eventually showing up at rehearsals with massive hangovers. Ashley's younger brother Jordan feels like they are not being that respectful and begins losing faith due to their lack of commitment. Reality check time comes when Ashley Banjo brings the 6-strong crew down to London's South Bank and makes them perform the routine in front of professional buskers and passers by alike with disastrous consequences. Actually, at the beginning it doesn't look too bad, but it gets worse as the music goes by and a botched trick leaves no doubt about the 'epic fail' status of the attempt. Luckily, Ashley's shock tactics have the desired effect and following the embarrassing performance, the boys finally start training as they should have done from day one. But despite the sweat and tears (and quitting beer) the routine is still not up to scratch. The final day arrives and the farmers are extremely tense, as everyone else who's been following their adventure. After warming up with a traditional country dance, the moment of truth arrives and you can't help hoping that they will pull it off, as it becomes clear how much it now means to them. And yes, they eventually do. 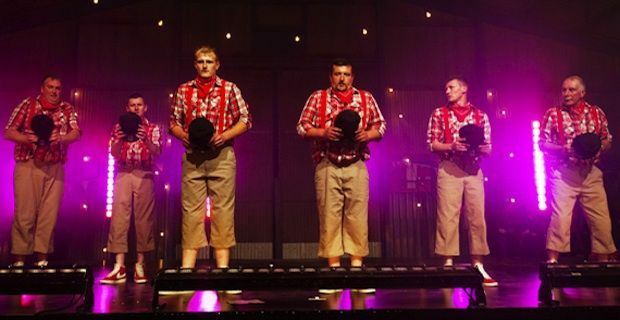 After a breath-taking entrance surrounded by blinding lights and smoke, the six lads take over the stage and perform the demanding routine spotlessly to the delight of a shocked audience of friends and family. Don't miss the fifth episode of Ashley Banjo's Secret Street Crew, Series 2, next Sunday 14, April 2013 at 7 PM on Sky 1 and Sky 1 HD, which will feature a Bible study girl group.